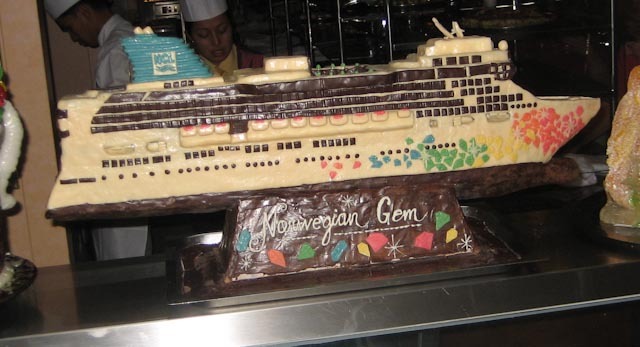 We went on a cruise, our first, on the Norwegian Gem, February 21st through 28th, 2009, from NYC. Before the cruise, I spent a lot of time looking for information on cruises, and then looking for information on this specific cruise and on this ship. I’m posting some of our experiences here to help the next folks doing the same. This is the Gem in the waters off Great Stirrup Cay, NCL (Norwegian Cruise Line)’s private island in the Bahamas. Actually, that was our planned itinerary, the one posted on Norwegian’s site. 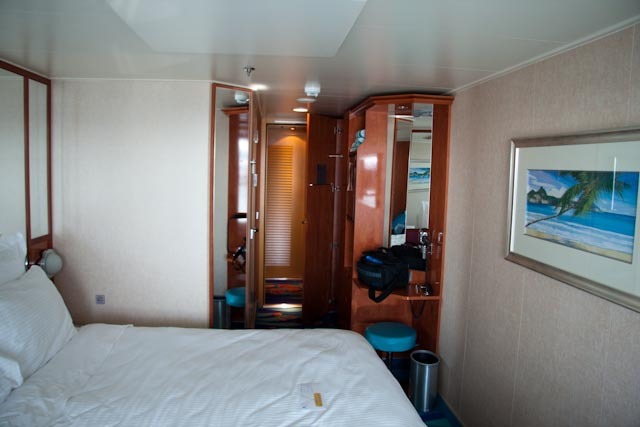 As the cruise got closer, the itinerary changed a bit. We made all the same stops, but some of the times were adjusted. Here are some notes on each day. Cruise day. The first cool moment of the cruise for me was driving down 12th Avenue and seeing the Gem docked at Pier 88 in New York City’s Cruise Ship Passenger Terminal. The blue marker is where the Gem was docked. I don’t know if it’s in the same place every week. Parking is easy to come by at the pier – you park right on top of the pier, drop your luggage by the curb and the porters bring it onto the ship and drop it off outside your stateroom later that day. I said parking is easy to come by, but I didn’t say it was cheap: It cost $210 to park for the week! Sniffer dogs check out your luggage on the way into the parking lot. Once we were inside and checked in, they gave us a number. I believe the number is based on when you arrived, so first come first board. Our 4pm sailing started embarkation around 12:15pm, and we were onboard (having been given number 20) about 12:45pm. While Samantha enjoyed the complimentary glass of champagne in the Crystal Atrium (the main reception area), I went up and signed up for the kids program. I was worried that there would be no room in the program, but that doesn’t seem to be a problem – there’s a stack of signup forms and you just fill one out and give it to one of the folks working in the kids program, and you’re signed up. Once signed up, you can bring your child up and drop them off any time the program is open and pick them up anytime. 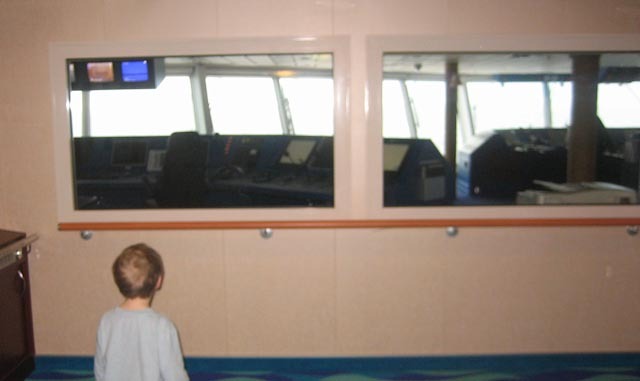 If your child is in diapers, they give you a “Handy Phone” to take with you on the ship. When the phone rings, your child needs a diaper change. This phone rings whenever you’re in restaurant enjoying dinner, or seeing a show. If your child is on the verge of being potty trained, it’s well worth doubling down on this effort before you’re onboard. Went for lunch at Grand Pacific. 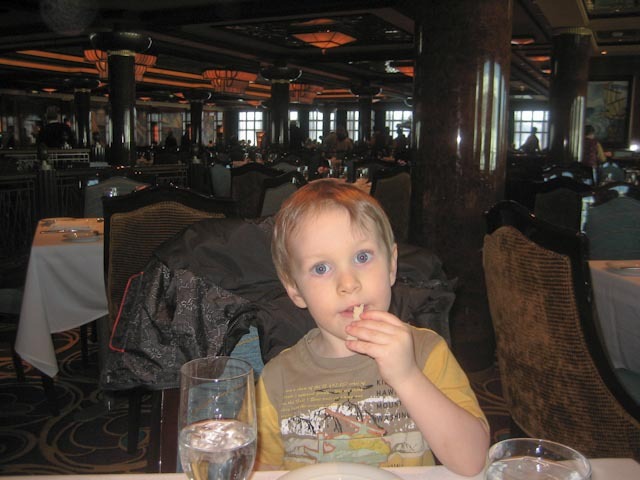 This is one of the main dining rooms, a very classy restaurant; not the best place to go with luggage and a toddler and weary from the voyage. It’s easy to get lost on the ship. The little couch pulls out into a bed for a child. The bathroom is small, but surprisingly functional. The shower has great water pressure, and was quite nice to use. We sailed out at around 4pm. We were on the starboard side of the ship, so we got to watch the Statue of Liberty from our balcony on the way out. Muster Drill was later the same day. Your key card has your Muster Station written on it, which is basically where on the ship you go if there’s an emergency. 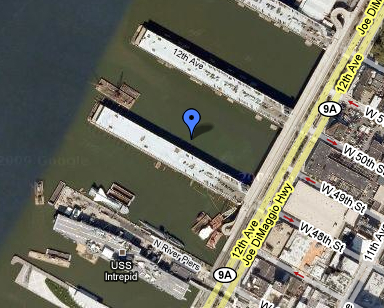 Muster Drill is to make sure everyone can find this location, and has a life jacket. We noted that we didn’t have a toddler life jacket, which apparently set a flag somewhere that we needed a life jacket. For the rest of the cruise, people kept bringing us life jackets – I think we had 4 toddler life jackets in our closet by the end of the cruise. I guess if there was a problem we could have strapped them together and made a little raft. In the evening, we went to our first show on the ship, basically an introduction to the officers and a short magic show. 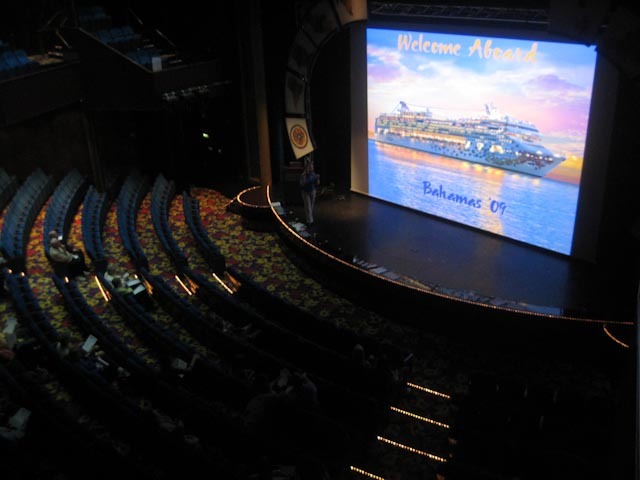 The theater is bigger than you’d think would fit on a ship! Here’s a picture of it from a session later in the cruise. Up early, took Matthew to the Garden Cafe (actually the Kids cafe near the back). Buffet was busy but there’s another buffet outside that’s not very busy when the weather isn’t great, so we had no trouble getting breakfast. I wanted a tray. An NCL employee with a tray said he couldn’t give me the tray but he could carry my food for me, so he followed me around while I got breakfast for my family and carried it to the table. Went up front to see the bridge. Found the Bliss lounge, a very peaceful place in the morning when nobody’s in there. I didn’t get a picture but here’s one on Flickr. Some drama late in the afternoon: The ship veered off course significantly to help with a rescue for someone who fell overboard off a tugboat. News story here. 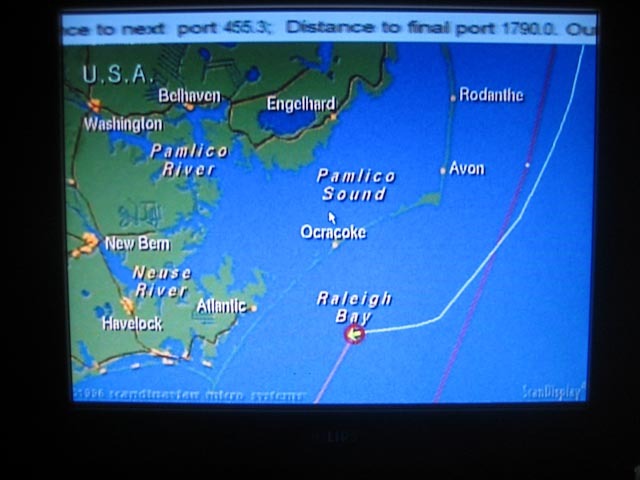 I brought my GPS so I could see where the ship was, but it turns out there was no need: The in-room TV has a channel that shows navigation information. Here’s the navigation showing our course change to help with the search. I had lunch at Blue Lagoon. A little disappointing – there was a long lineup, my tuna melt was small, it was quite slow, and they messed up my order a couple of different ways. Blue Lagoon is, I think, the only 24 hour table service restaurant onboard. Saw the show – World Beats – good show, good dancing. Sea was rough and some of the things the dancers had to do were made a little harder by the ship moving so much but they handled it gracefully. The kids program would have taken our son to the show, but the way it was presented in the schedule made it sound like we needed to come pick him up and go with him. We went up and said we were there to take him to the show and they checked him out; then we found out that we couldn’t go with the kids program all together, it was him in the program or with us out of the program. We took him ourselves and he probably enjoyed it more with us than he would have with all the other kids. it was a very dynamic show, lots of stuff going on, so it kept his (2-year-old) attention throughout. Nice Latte, Cappucino in Garden Cafe, free, in the afternoons. Free OJ, Apple Juice and Cranberry Juice there in the mornings. You can also pick up small milk boxes around the breakfast cereal and keep them in your fridge for later in the day (or of course order drinks from room service any time). The first sea day from NY in the Winter is too cold to do anything outdoors. 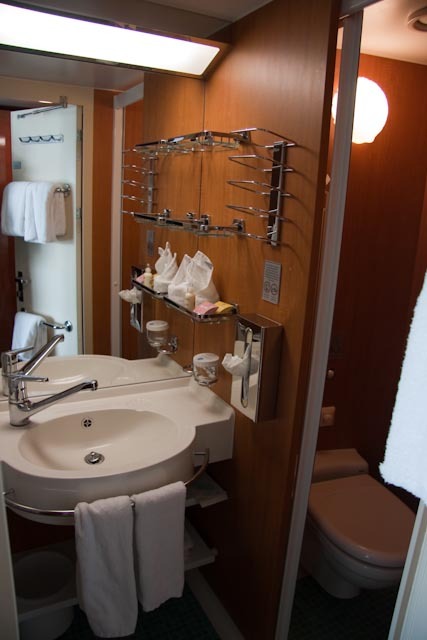 There’s always someone in the hot tub (which is heated – and you can check the temperature on the TV in your cabin!). We had breakfast at the Garden Cafe. Always good. Sailed into Port Canaveral around noon (original projected time was earlier, but this changed some time before we sailed). Lots of interesting ships to see on the way through Port Canaveral to the pier where we docked. 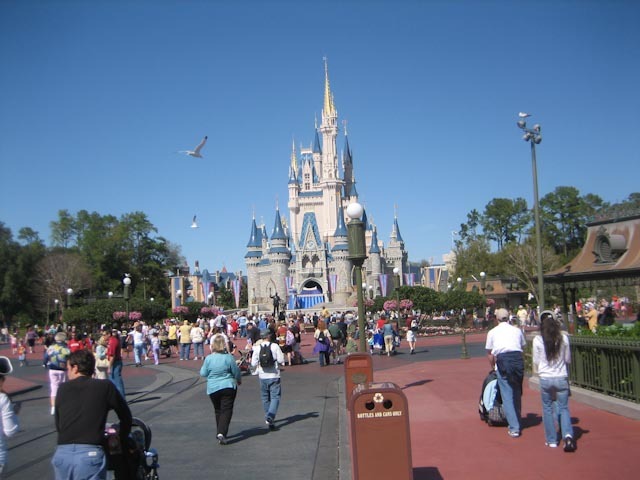 Went to Disney World. Met in the Stardust Theater at 11:50am, headed for the buses around 12:30, arrived at Disney around 1:30pm. Three buses went to Disney; buses started coming back at 7:15, leaving as they filled. Last bus was scheduled to leave at 8, but was a bit late leaving, maybe 8:15 to wait for a family who had been held up at the monorail, so we had a chance to catch a bit of the fireworks from the warmth of the bus. It was pretty cold by dark. Got back to the ship just as the 2nd show started; we ended up not going. Too bad. We didn’t pay for a transfer ticket for our two year old, figuring he’d take a seat if there was room and we’d hold him if not. In our case there was room for him to have his own seat. Disney was great. Perfect weather during the afternoon, although rather cold at the end of the day. A bit busy, even in mid-February; ride wait times for 20-40 minutes average, and when you’ve only got 6 hours, that makes it tough to see much. We went on 4 rides (Pirates, Mansion, the raceway, and Buzz Lightyear). We’ve been to Disney before so this was more of a drive-through Disney experience; don’t make this your only Disney vacation! Great Stirrup Cay is Norwegian’s private island, and is basically a beach cove with BBQ, music, snorkeling and some other activities going on all day. 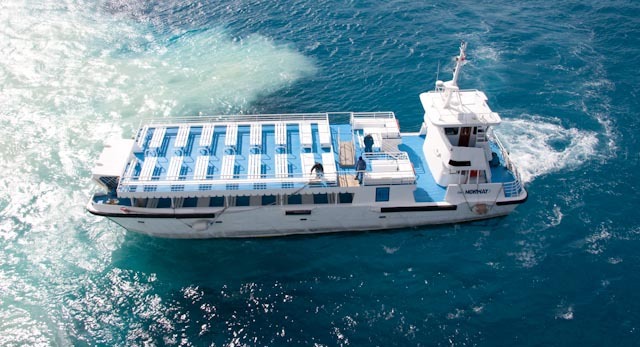 Getting to the island involves a process called tendering, which is basically being ferried to the island and back, and takes a long time. 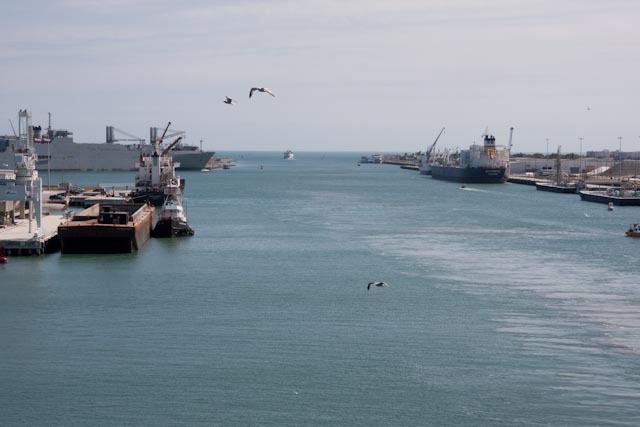 I don’t really understand why – the tenders (that’s what the boats are called) have a passenger capacity of over 400 people, so you’d think 5 tenders would be enough to get everyone from the ship to the shore. At 10am they start giving out tender tickets, which just have a number on them, and when the tenders are ready, they start calling out numbers. We got number 10 (I didn’t go down for a ticket until about 10:45am), and we were on the island by about 11:30. Some of the people on the tender had tickets numbered eight through eleven. Tendering continued for most of the morning. The beach was nice. There are a few hammocks, and many lounge chairs. All the loungers on the beach to the left of the tenders (to the right if you’re standing on the beach looking towards the ocean) were taken, but there’s a nice little set of lounge chairs off to the other side a bit of a walk and there were very few people there. It was a great place to go with our son since we got chairs right by the water and spent the time throwing stones into the water while we relaxed. I was eyeing the hammocks for a while, and noticed that while someone had hung a towel near one, it had been empty for over an hour. I moved in, and about 10 minutes later, someone showed up and commented that they had left their bag on the chair. Sigh. The kids program was open for free play from 9am to 10am, and then Port Play (which costs $5/hr) from 10am to 6pm, then free after that. We kept our son in until 11am[ that doesn’t jive with what you said about tendering at 10:45], which just made the morning smoother – we got time for breakfast, he had some fun in the program, and I don’t think it ate into our time at the island much. I wish I’d brought my good camera to the island. The air is so clean and clear that the view of the ocean and the ship from the island is breathtaking. The first photo on this page is a photo of the ship, taken from the beach. There was BBQ available the whole time we were ashore, and a live band playing. Before dinner we stopped in Bliss, the lounge at the back of the ship, for some bowling. I don’t know who decided it was a good idea to have a bowling alley on a ship, but the motion of the ship made every shot basically random. Tip: If you’re going to bowl, do it while the ship is in port. Souvenir drinks are, well, they’re not great souvenirs. Tall brightly coloured plastic glasses. In the evening, Tequila (the Mexican restaurant) was half-price, so we dropped our son off in the kids program and went for dinner. Just as we were ordering, the phone rang: Matthew wasn’t happy, and we should come pick him up. So much for Tequila – but at least they didn’t charge me the cover charge (which they would normally do when you don’t show up for a reservation). Pulled in in the morning. Ship cleared, but we slept in and didn’t leave until around 11:30. The walk from the ship to the terminal is quite long. There’s an occasional shuttle that I think is free; we didn’t take the shuttle, but wished we had after all the walking (with the obstinate nearly-three-year-old) we did today. Picked up a taxi tour on the pier that took us on a tour of the city and to Atlantis, where we got to see the aquarium from the lobby. I’m sure the full Atlantis experience is awesome, but we’d booked the Dolphin Encounter for 3pm (the only one available when we booked – book early kids!) and because of traffic, our 2 hour taxi tour turned into a 3 hour tour and ate up our shopping time. We got back to the ship at around 2:20pm, just enough time to order room service and eat while we got ready, and head back out. The Dolphin Encounter was pretty good. We got some great pictures. You get some dolphin kisses, get to touch the dolphins, feed them, and they swim up in front of you and you grab their fins and “dance” with them. It was fun, although felt a bit like an assembly line. Now you rub belly. Now you get kiss. Now you feed. Thank you, come again. For more interaction time with the dolphins you can upgrade to the Dolphin Swim, but we didn’t do that. 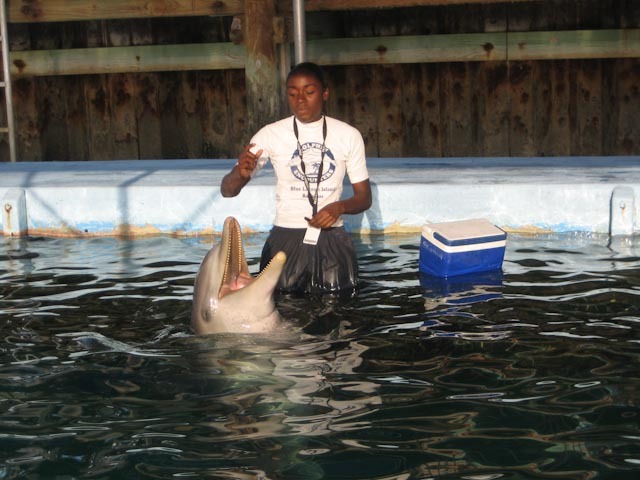 The Dolphin Encounter is on Blue Lagoon Island which is about a half hour boat ride from the pier. We got back from our 3PM tour at around 6:40pm, and the stores were all closed, so we can’t really say anything about shopping in Nassau. Back to the ship for dinner (Garden Cafe, which had a chocolate fondue available for dessert), and after dropping our son in the kids program for a few hours, we went to the Spinnaker Lounge to see Second City. They were good. Not as good as Whose Line Is It on their best days, but at least as good as Whose Line on an average day. A little tip about the kids program. If your child is in diapers, they’ll call you on the Handy Phone to get you to come change them. This is no fun at all. Twice during the Second City show I had to schlep back to the room to pick up a diaper, head for Tree Tops, then back to Spinnaker, and that’s a lot more walking than it sounds like. Bring diapers with you when you’re out and about on the ship; you can save yourself a lot of walking. Later in the evening, there was a barbeque on the pool deck with a live band and a great party atmosphere. This was the first time on our cruise that it was actually warm enough to enjoy a few minutes out on the pool deck at night (and by warm, I warm enough that you could comfortably stay outside in a t-shirt). They dropped off an “all the laundry you can fit in this bag for $24.95” bag today, and we filled it up. Calculated that at the regular price it would have cost $107 to get all the stuff cleaned that we managed to pack into the bag. But beware: You won’t get this bag back until Friday. 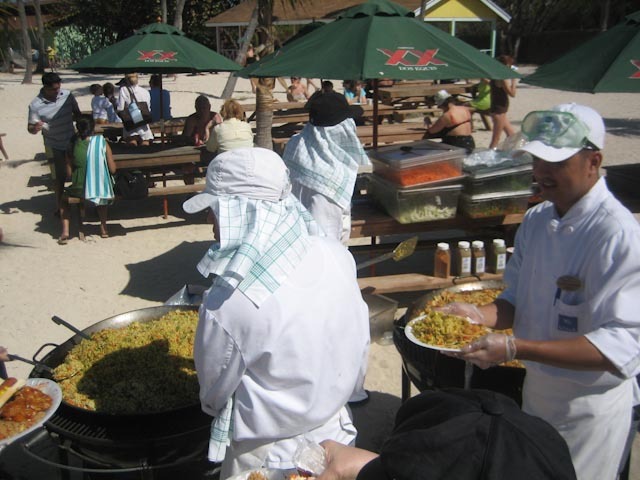 Don’t put your only long pants in the bag, or you won’t be able to dine at any of the nice restaurants in the evening – the evening dress code for all the restaurants except Blue Lagoon and Garden Cafe is no shorts and no tank tops. Sailed into port around 7am. The ship was cleared with local authorities by around 8am, and people were heading off the ship and to their various shore excursions. We didn’t have an excursion booked, and instead left the ship after breakfast, around 9:30, to head downtown for some shopping. It’s a much shorter walk to the “terminal” than at Nassau, and there are taxis waiting as well as a small market. It cost us $10 round trip for a taxi to downtown, and because the stopover was so short (we had to be back to the ship by 11:30am), the taxi driver waited for us downtown while we shopped. This worked out pretty well. Our driver, as well as a boutique shop lady both mentioned dissatisfaction with the shorter time alloted Freeport when we spent so much time at Nassau. Tourism is their biggest business, so it hurts them when the cruise ships make such short stops. Shopping was nothing special. A market with maybe 50 stores, most of which were jewelry or women’s clothing. A liquor store had some inexpensive local rum ($9/bottle). One interesting sight at the liquor store: A local came in and bought a bottle of beer (Guiness), and the lady at the cash pulled out a bottle opener and opened the bottle and put it in a brown bag for him. He walked out of the liquor store drinking it. Coming from Canada where liquor is so controlled, that was a strange sight. The ship pulled out of port around 12:15pm (a bit late) and now we’re sailing back to New York. Bummer. But at least we’ve got a full sea day onboard ahead of us. The show at the theater is a 70s musical variety show that was great! 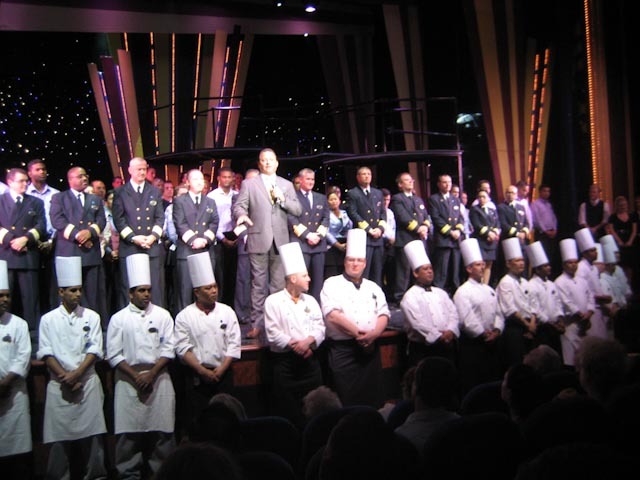 After the show, the Cruise Director brought up the ship’s staff to say goodbye and thank you, and the Cruise Director, Ray, gave a special acknowledgement that we’re in tough economic times, and expressed appreciation that we chose to cruise with Norwegian. I thought that was a nice touch. The Garden Cafe turned into a Chocoholic Buffet at 10:30pm, with displays of chocolate creations and tons of great chocolate desserts. 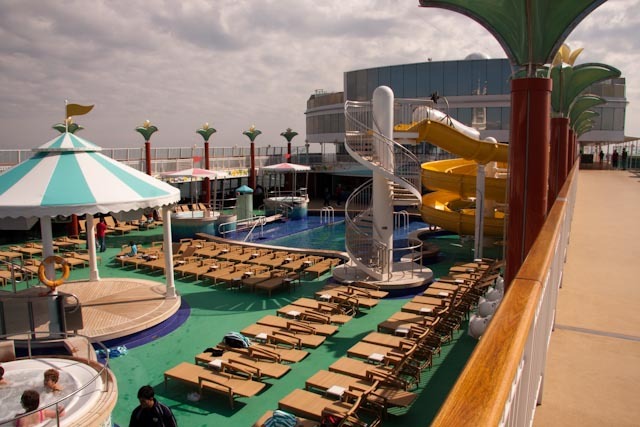 There was a BBQ on the pool deck as people celebrated their last opportunity for comfortable weather as we sailed back to the wintry cold of New York in February. The Spinnaker lounge had a great band called Kartune, who played until the “New Years” celebration at midnight. Lunch at Grand Pacific. They do have a kids menu if you ask for it. Still 64 degrees fahrenheit Friday at 4:40pm; pools are nice and warm. Received instructions on luggage and disembarkation today via the in-room iTV. The process is that we pick up a luggage tag at reception, and the luggage tags are color coded for what time you want to disembark. Your luggage will show up at the pier around the time that the tag is color-coded for. If you can carry all your own stuff off, then you don’t need to give them your luggage, you just walk off with it. But for a 7-day cruise with a toddler? Not a chance of that happening. We took the Lime luggage tags, which estimated that we’d be called to disembark at about 10:30am. Watched the Colorz show. It was quite nice. The cruise director mentioned that people always line up early to leave the ship even though they don’t start disembarkation until 9:45, and he suggested waiting somewhere comfortable instead of lining up. Why go downstairs early? Wait in the Spinnaker lounge and watch the ship dock. Express disembarkation is crowded, and didn’t look like fun. People were lining up as early as 8am. Me, I’d rather wring a few more hours out of my vacation. You don’t have to check out of the room until 10am. Reviewing my Internet charges, I spent less using pay-as-you-go pricing ($0.75/minute) than I would have paid if I’d bought the cheapest rate plan ($55). Rate plans start out with a 20 minute “free” bonus, the bonus disappears after a few days, and then in the last few days, new cheaper options show up like $8.25 for 15 minutes. The trick to making good use of the Internet time is to go online, do your stuff, and then get offline as quickly as you can. Using Gmail’s offline feature made email a 2 minute trip no matter how much time I spent reading and answering emails, because I’d connect and let Gmail synchronize, disconnect, read, respond, then connect and let it synchronize again. Internet on the ship is *slow*, so don’t count on going online and downloading YouTube videos to watch offline or anything like that. The ship was very clean, and the staff seemed like they enjoyed working there. It’s a great, positive atmosphere. Here are a few notes that didn’t make it into the daily notes. The ship really wants to sell you artwork and jewelry. There were constant reminders, in the daily newsletters and announcements, that there were art auctions and gemstone presentations and whatnot going on. We weren’t shopping for either, and it got somewhat annoying after a few days of it. The fancy restaurants have a great ambience, but I don’t think the food is that much better than what you get at the main buffet, the Garden Cafe. There were some great meals there, and different ones every day. Don’t feel like you have to hit the table service restaurants to get the best meals. There are only 2 easily accessible plugs in a Balcony Stateroom. If you need more (to charge cameras or other toys), bring a power bar. 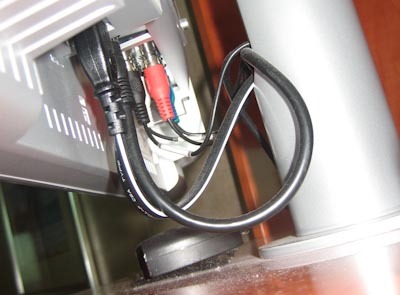 The TV has multiple inputs, so you could bring a DVD player and plug it in, but neither the remote nor the buttons on the TV give you any way to switch inputs. You’d have to disconnect from the ship’s video, and there’s quite a bit of good info there (including the ability to order drinks from the TV!) so you probably want to bring a laptop or something to play DVDs on if that’s how you want to watch movies. 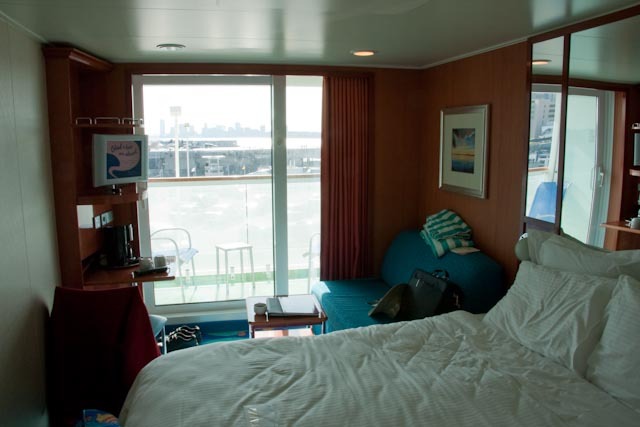 Bring cash – the ATMs on the ship charge a $5.50 service charge for any withdrawl. I left my cell phone turned on while onboard, and let it roam (the provider was “cellular at sea”). I used some text messages and made some short phone calls; I’ll update this page with the charges when I get the bill. Update: I got my phone bill. $0.60 per SMS message, and $6.00 per minute calling from the ship to Canada. I use Rogers as my cellular provider in Canada. I don’t know how different this rate would be to different carriers or countries. Every day, Norwegian drops off a newsletter in your room. The newsletter is called Freestyle Daily, and gives you all the information about what’s going on on the ship. Here are the dailies for our cruise: Day 1 (Leaving New York), Day 2 (Sea Day), Day 3 (Great Stirrup Cay), Day 4 (Nassau), Day 5 (Freeport), Day 6 (Sea Day), Day 7 (Back in New York). 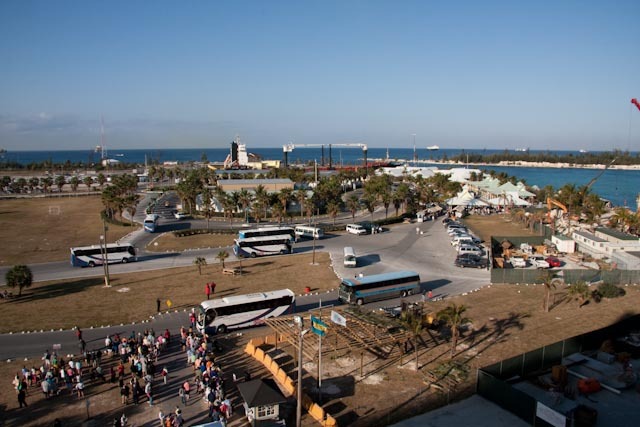 Here’s the port information for Port Canaveral, Great Stirrup Cay, Freeport, and Nassau. More photos from our trip are online here.